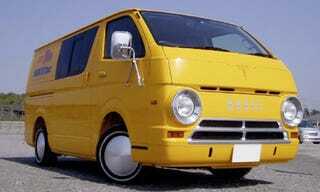 The other day we showed you some cute little Japanese Kei cars converted to look like vintage American vans. Turns out they were the creation of a company called Dream Factory Blow. They're sort of an American-style surfing-obsessed customizing shop, but since they're in Japan, they work their magic on JDM rides. While stumbling around their non-English website, we found this thing. Apparently, they call it the Papa Rider, but it may not be what you initially think it is. Now, this may look much like a vintage Dodge van that some stoner accidentally had shipped to the other side of the Pacific. But give it more than a passing glance, and you'll notice that there appears to be a Toyota Hiace van somewhere in there. Our Japanese skills are limited to what gets translated into English by BableFish, so we're not too sure and what the rationale was behind this, but we do know for certain that this thing is totally awesome.